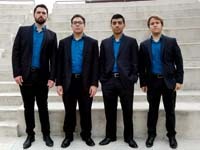 Bio: The Anabru Saxophone Quartet was formed at the Unvieristy of Illinois in Fall of 2017. The members come from unique and decorated backgrounds, allowing the quartet to be informed by a wide variety of expeierneces and saxophone pedigrees. Currently, the group is comprised of Doctor of Musical Arts candidates Evan Clark (soprano), Wilson Poffenberger (tenor), Gabriel Piqué (baritone) and Master of Music student Michael Chapa (alto). The Anabru Quartet is coached by Debra Richtmeyer.